Indian Music is fundamentally melodic and has ample scope of improvisation and thus very creative. The Indian musical system expresses the beauty of Nature, sentiments and moods through various Ragas. India has a rich heritage of folk music besides the elaborate classical music comprising the rage structure. 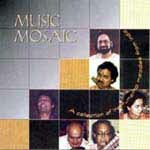 This CD has a collection of incremental melodies based on Indian Ragas and Folk Tunes rendered by renowned artists.